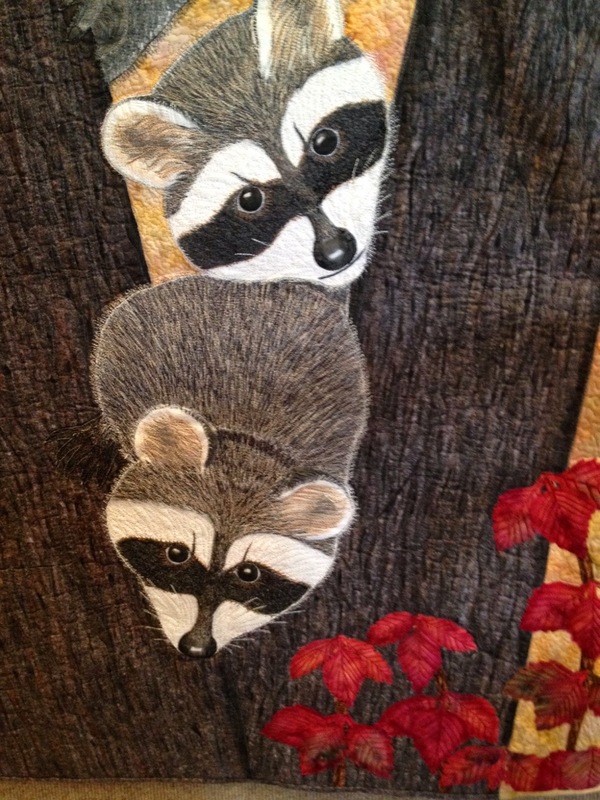 Probably the most talked about piece at our show this past weekend is this awesome wallhanging by Kathy Albee. It looks like you can just touch the fur on the muskrats and feel its texture. 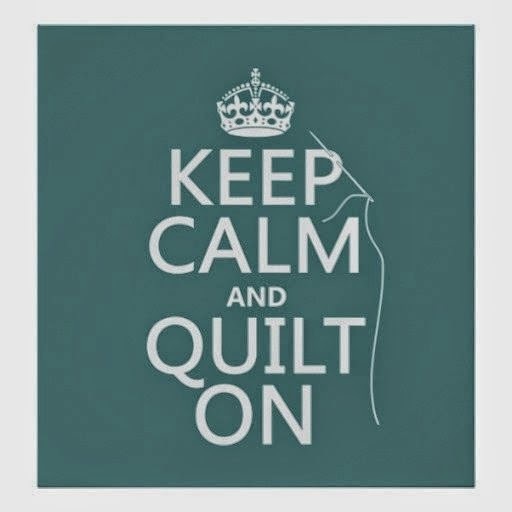 However, that is all done with thread. As I understand it, she painted the animals then did the thread work on her long arm, cut them out and fused them to the hanging. 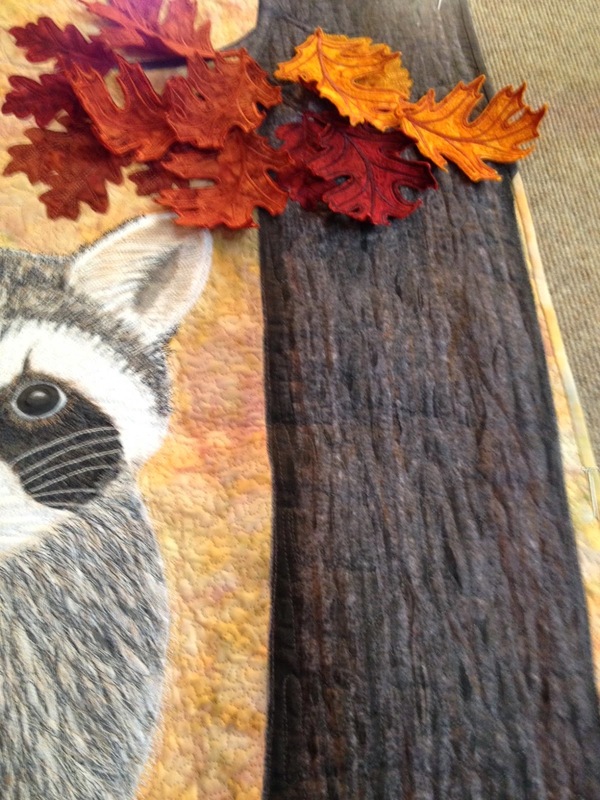 The leaves are beautiful - these are full of threadwork, also. And these are three dimensional. It is such a stunning piece of work. 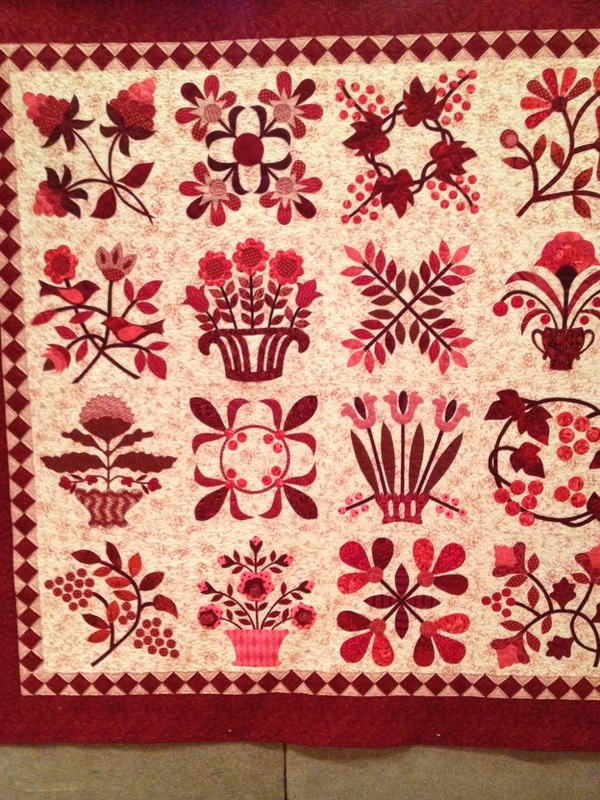 Another lovely quilt by Diane. 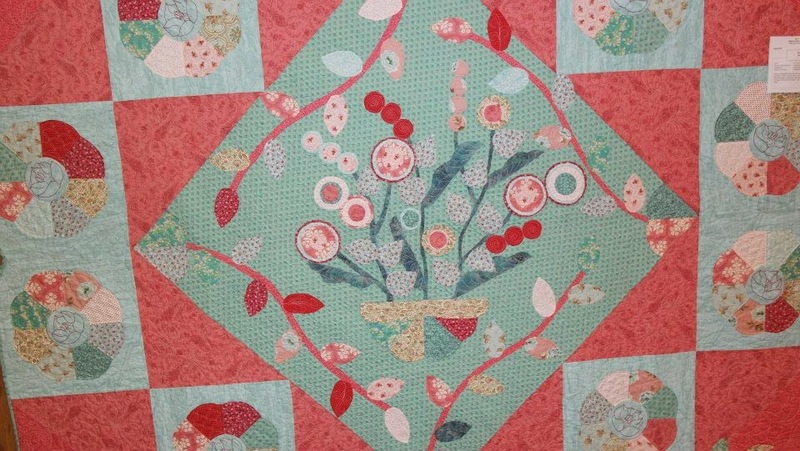 This is hand appliqued and gorgeous. 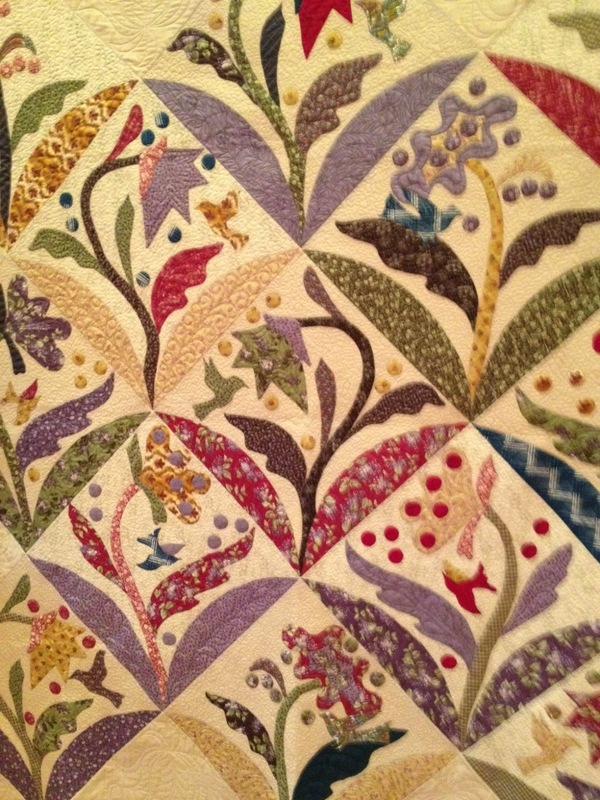 The center of yet another beautiful quilt - Pretty by Hand by Leslie. The colors are so fresh and pretty. Another darling piece by Leslie. I think the name of this is Fifty Shades of Gray. 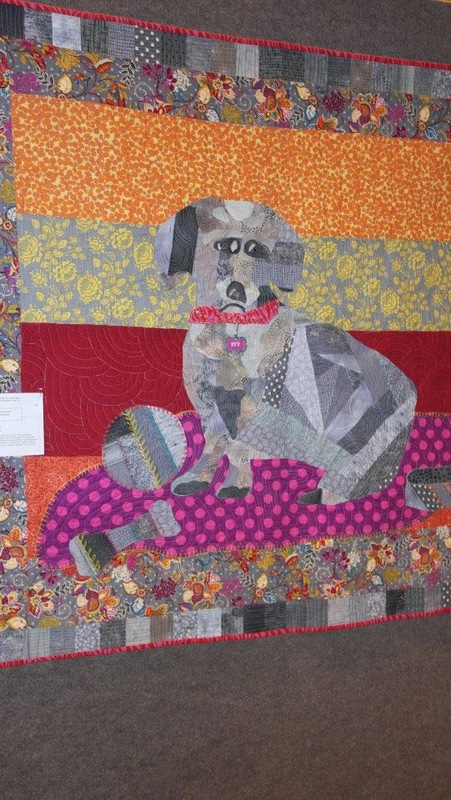 Her little doggie is depicted here in this fun quilt. 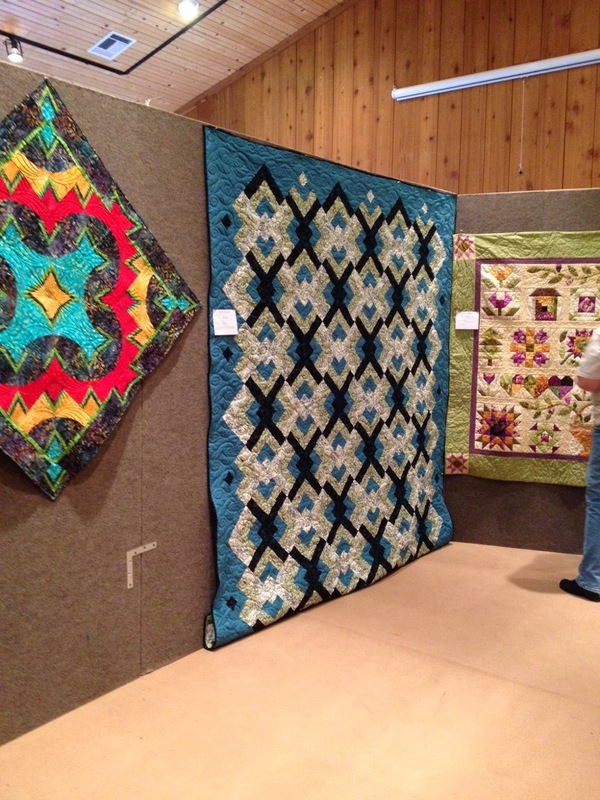 I'm sorry I can't remember the names of the two larger quilts shown here. The smaller one is what we will be making in a class given by Linda and Leslie this coming Wednesday. Looking forward to that one - a combo of paper piecing and hand or machine drunkard path blocks. A lovely quilt made by Kathleen, one of our newer members. Kathleen is English and has that great accent! Sounds like she should be on Downton Abbey. Here is my red applique hanging at the show. It always fun to see them hanging and look at them from a distance. I do like this one - it was a fun one to make. 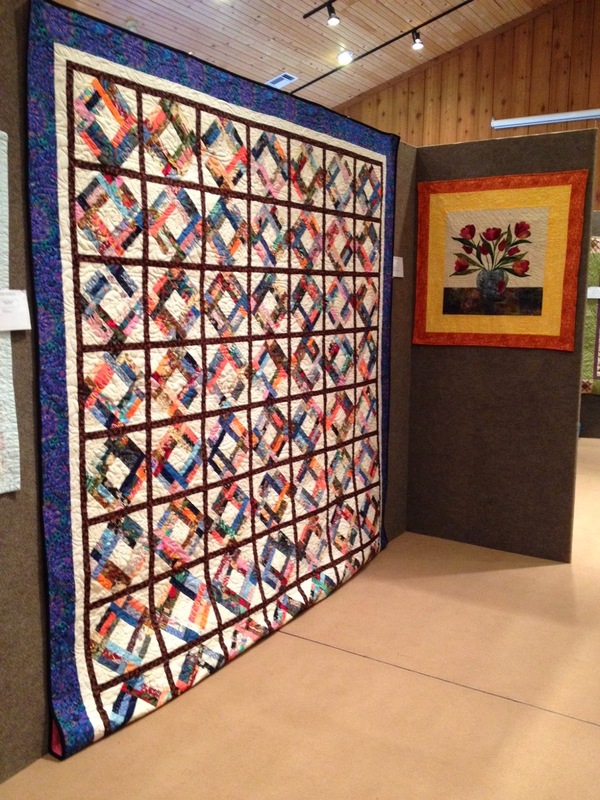 Tomorrow I will post a few more plus some of the pictures of the trip through Michigan challenge quilts. Very impressive display. And a little story - one of our show visitors who I have seen quite a few times came up to me yesterday afternoon and told me she had discovered my blog. The dear lady has gone back to the very beginning of this little old blog (will be six years the end of May) and has been reading it through it's entirety. I can't tell you how that warmed my heart - makes me feel so good to know that people enjoy the plain, everyday things I talk about and put on my blog. Thanks so much to her and to all of you who pop in and read Funoldhag!! This is one of the things I enjoy doing in my old age and it's nice to know people enjoy it. Bless your hearts! Oh Happy Days it's my lucky day!